Home Entertainment Is Lindsay Lohan pregnant or just an April Fool? 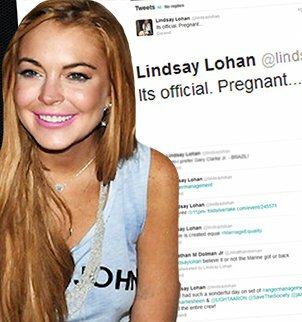 Lindsay Lohan, who is dating City Of The Sun guitarist Avi Snow, tweeted a message claiming she is pregnant, on Monday, April 1. It could just be that Lindsay Lohan, 26, is getting in on the April Fool’s Day revelry – albeit hours after the 12 noon deadline. Lindsay Lohan was last photographed in Brazil on Sunday night at Florianopolis Nightclub. The actress’ new boyfriend Avi Snow recently opened up about their relationship, describing her as “a lot of fun”. In his first interview since they were romantically linked, City Of The Sun guitarist Avi Snow refused to officially confirm or deny his relationship with Lindsay Lohan, but didn’t hold back in his compliments of the Mean Girls star. Meanwhile Lindsay Lohan has demanded Adderall during her time in rehab. The star has reportedly insisted she will only enter a court ordered treatment facility if she is allowed to have the prescription drug – used to treat Attention-deficit/hyperactivity disorder – which she claims she needs to function, according to TMZ. Lindsay Lohan was recently sentenced to 90 days in rehab after pleading “no contest” to charges for lying to police about driving during a car crash last June but has jetted to Brazil for some partying and promotional appearances before entering the facility, which has horrified her father.